Solastalgia: a combination of the Latin word solacium (comfort) and the Greek root –algia (pain), refers to the feeling of pain and sadness when one realizes that a beloved place is under assault. Artist Cristi Rinklin explores the term and its impact around the country in an exhibit opening at Gustauvus’ newly-remodeled Schaefer Gallery on Thursday, October 12. 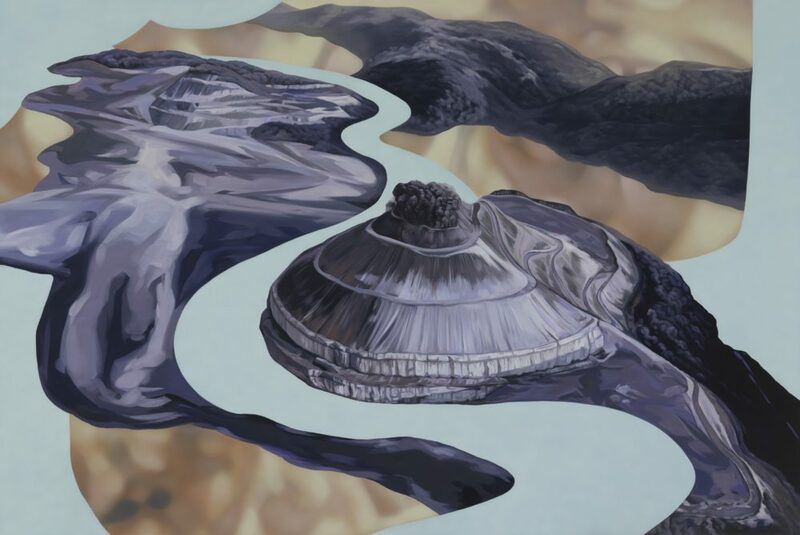 Rinklin’s show is a combination of painting and technology fused to create works that examine environmental degradation and the fragmentation of landscapes scarred by natural disasters, climate change, and most recently, mining. Her work is colorful and bold, but she says beyond the striking initial impact are deeper layers. “The way I paint is very lush, I paint in a way that is very beautiful to look at, but there’s also something kind of melancholic about it,” she says. Rinklin has been working on these pieces since 2012 and typically uses several combined sources for her imagery including online image searches. This is important because she feels much of the way we view nature is mediated through the internet. However, for her more recent works focused on mining, Rinklin wanted more control over the images. As a result, she took things a step further and visited some mining locations in West Virginia, shooting drone footage and photos of the landscapes. Through an extensive technological process she then took the photos and layered them with her own watercolor paintings. The resulting works are a hybrid of technology and more traditional art, which give them a different look that is captivating. “There is a seduction that happens with these images, but hopefully people will be compelled to stay with it and think about it. There is something else there that will percolate and stay with them, get under their skin. There is a beauty and tragedy in what we’re capable of doing to the landscape,” she says. Rinklin’s exhibit is funded by a grant from the Johnson Endowment and Artist Series and she will be on campus working with Gustavus art students October 10, 11, and 12. Rinklin will give a lecture on her exhibit at 4 p.m. on October 12 in the Schaefer Studio Art Building Lecture Hall, which will be followed by the opening reception of the exhibit at 5 p.m. in Schaefer Gallery. Both events are free and the public is encouraged to attend. The exhibit will remain open to the public 9 a.m. – 10 p.m. daily through October 25.